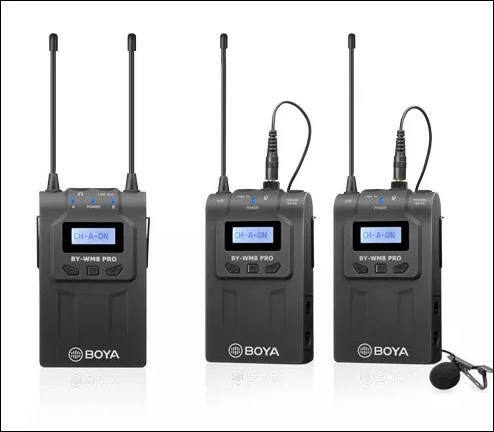 The BOYA BY-WM8 Pro-K2 is an upgraded UHF Dual-Channel Wireless Microphone System for capturing audio with dual subjects, features an easy-to-read LCD display, a wide switching RF bandwidth, PLL-synthesized tuning and digital companding circuitry. The BY-WM8 Pro-K2 system consists of two bodypack transmitters, a camera-mount receiver, and two omnidirectional lavaliere microphones. Also included with this system is a shoe-mount adapter, a single 1/8" to XLR output cable, a single 1/8 to 1/8" output cable, carrying case. How is channel bleed, how is noise floor? Can the TX gain be adjusted? Those are some of the major flaws I've noticed in the ultra low budget ones. Its is digital system as I understand, so question is mostly pointless. In such system channel isolation is almost perfect, noise floor is also defined by short analog parts. Can the TX gain be adjusted? Those are some of the major flaws I've noticed in the ultra low budget ones. It is not ultra low budget one. Now it is best among Chinese made. It is not ultra low budget one. That is not just low budget, that is ***ultra**** low budget! Thus of course I'm curious what compromises have been cut. Pro K2 is around $296 or such. Well, mostly margins had been cut. Plus mikes included and analog parts are slightly worse. Hi, I am looking for wireless mic. Which one is better between Boya Pro K2 and Saramonic UWMIC9 ? Is there another good system (1 RX / 2 TX) in the range price of 400$ ? Boya is cheaper on deals usually and newer. Very detailed testing is needed to say that is better. I believe it's an analog system. The modulation is listed as FM (analog) in the FCC test report. The companding is digital, but that's just one stage of processing before an analog signal is fed to the modulator. Now that the Senal AWS-2000 has been on sale for US$250 at B&H, I'd say it is a no brainer to wait and buy a Senal AWS-2000 rather than either of those other two sub par wireless. I think it is not so nice to go here and post such (it had been one day deal). Especially as you never tried any of them.